The scientists successfully rid 37 pigs of viruses hiding in their DNA, overcoming one of the big barriers to transplanting pig organs to people. But experts said it was a promising and exciting first step. 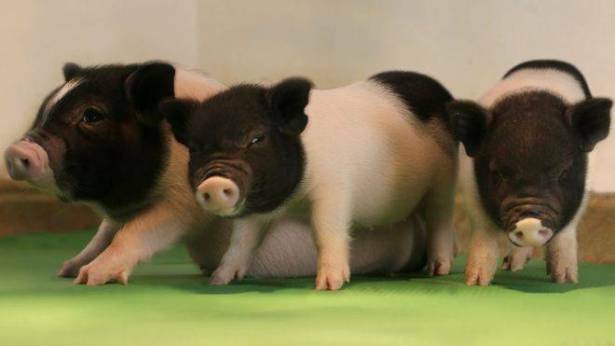 The study, published in the journal Science, started with skin cells from a pig. Tests identified 25 Pervs - porcine endogenous retroviruses - hidden in the pig's genetic code. Experiments mixing human and pig cells together showed those viruses could escape to infect human tissues. But the researchers then used the game-changing gene-editing technology Crispr to delete the 25 Pervs. It then took cloning technology, the same used to create Dolly the sheep, to place the genetic material from those cells into a pig's egg and create embryos. The complex process is inefficient, but 37 healthy piglets have been born. "These are the first Perv-free pigs," Dr Luhan Yang, one of the researchers from Harvard University and the spinout company eGenesis, told the BBC News website. They were also "the most genetically modified [animals] in terms of the number of modifications", he said. If xenotransplantation - using organs from other species - works, then it has the potential to alleviate long waits for a transplant. More than 100,000 people need an organ transplant in the US. There are about 6,500 people on the UK waiting list. Dr Yang told the BBC: "We recognise we are still at the early stages of research and development. "We know we have an audacious vision of a world with no shortage of organs, that is very challenging, but that is also our motivation to remove mountains." Pigs are particularly promising for xenotransplantation as their organs are a similar size to humans', and the animals can be bred in large numbers. But removing the viruses is only half the challenge, even organs donated from other people can cause a strong immune reaction that leads to the transplant being rejected. The US team is investigating further genetic modifications to make pig organs more acceptable to the human immune system. Darren Griffin, a genetics professor at the University of Kent, said: "This represents a significant step forward towards the possibility of making xenotransplantation a reality. "However, there are so many variables, including ethical issues, to resolve before xenotransplantation can take place." Prof Ian McConnell, from the University of Cambridge, said: "This work provides a promising first step in the development of genetic strategies for creating strains of pigs where the risk of transmission of retroviruses has been eliminated. "It remains to be seen whether these results can be translated into a fully safe strategy in organ transplantation." The researchers had to overcome unexpected challenges from performing so much gene-editing in one go. The Crispr technology works like a combination of a sat-nav and a pair of scissors. The sat-nav finds the right spot in the genetic code, and then the scissors perform the cut. But making 25 cuts throughout the pig's genome led to DNA instability and the loss of genetic information.